Bang. Frieda popped into my head. Why would that be? Sometimes a particular person will just pop into your head. Have you had this happen to you? You might know why, or maybe you have no idea at that moment why you are thinking about that person. Something like this happens to Barnabas when he was sent to Antioch to investigate some rumors. What was happening there? Why were these Jewish Christians having interactions with Greek speaking people and how is it that these Greeks were receiving Jesus? 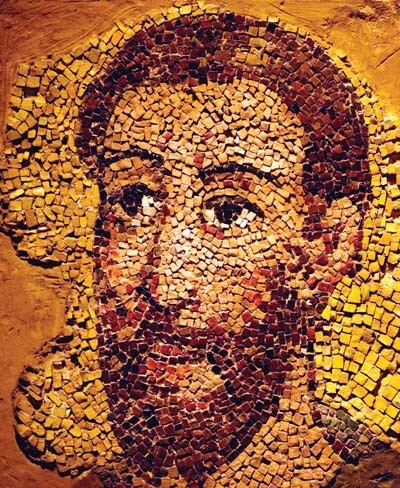 Barnabas was amazed at what he saw. It warmed his heart and inspired his spirit to see that the faith of these new Greek Christians we bright, alive and Spirit filled. How could this be? What was God doing and who would know how to engage this new possibility? What he saw, warmed his spirit and engaged his mind… and he thought of Saul, well Paul actually. Some years earlier Saul of Tarsus have been converted to faith in Christ after he had previously persecuted Jewish Christians. But his first months of Christian life and faith had gotten him into more debates, scrabbles and augments than any of these young Christians were comfortable with. So, he was invited to return home to Tarsus. But Barnabas remembers Saul, who had become “Paul” in his conversion. He remembered how insightful and passionate Paul’s was. Barnabas remembered that Paul grew up in a Greek speaking community and understood these Gentiles as well as the Christian faith. He might be a perfect fit to encourage this new community in faith.What he saw, warmed his spirit and engaged his mind… and he thought of Saul, well Paul actually. Some years earlier Saul of Tarsus have been converted to faith in Christ after he had previously persecuted Jewish Christians. But his first months of Christian life and faith had gotten him into more debates, scrabbles and augments than any of these young Christians were comfortable with. So, he was invited to return home to Tarsus. 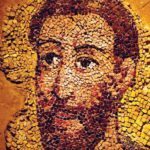 God as a way of making use of each of our unique gifts, experiences and abilities, even when they seem to not be valued or needed at one time or another. It is always our work to find the places where God will use us to make a difference in the lives of others. Barnabas played his role and helped Paul find his. God is still doing wonders among us like this, building community and shaping our lives to care for people we come to meet and know. It is a curious wonder how God works in our lives filled with great graciousness. This work we do of finding our neighbors along the journey of faith can indeed be godly work, filled with the activity of Christ among us. Just as my heart is thankful for Barnabas and Paul, so I pray for this time and our gifts that we might be alive in the Spirit and attentive to God’s activity within us and around us. This is the Graciousness of God at work. AMEN. In response to the violence and tragedy at Great Mills High School today, March 20, 2018, a community Prayer Service is being held at Church of the Ascension (21641 Great Mills Rd, Lexington Park, MD 20653). The service begins at 6:00pm, this evening, March 20th and a number of local clergy will participate. All are welcome! I have always thought that asking questions of your faith, about how it is alive in you was the point of the Lenten Season. I just haven’t figured out how eating fish on Friday or giving up watermelon for the season would really have much of an impact of whether I loved or trusted God. I wonder how my faith can be real enough to help me parent meaningfully and love my neighbor in a way that is pleasing to God and helps me grow as a person. I am always looking for tools that will help me further or deepen my learning to love God with all my heart and mind and strength. I don’t think it is surprising that I found a conversation partner in a Divinity School Professor (assistant professor). It doesn’t surprise me that she is bright, witty and shares from the heart easily. But I am deeply grateful that she is a parent of a two (now three) year old and that she can write and speak from places of great joy and deep pain in her life. I guess it shouldn’t surprise me that this thirtysomething writer is facing the ravages of stage IV cancer treatment. 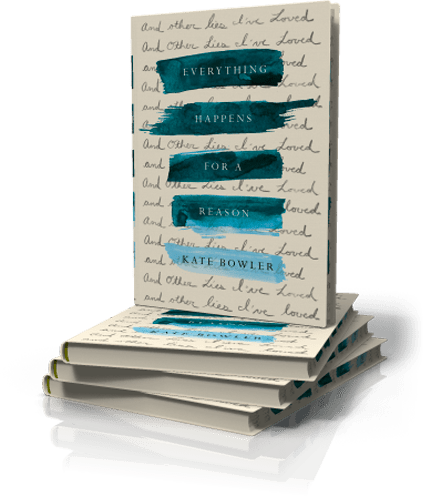 But what does surprise me is that Kate Bowler can write, speak, blog and engage some of the toughest veneers that our cultures has to offer and invite us into a deeper, honest and unvarnished beauty that loving God can fill us with while we yet live in this challenging world. 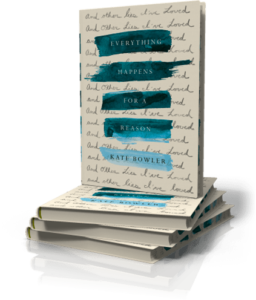 So this Lenten Season, I invite you to walk this journey with me and with Kate Bowler as we read together her book about facing life, faith and the way the world is through her book “Everything Happens for a Reason: and Other Lies I have Loved.” So, Here is my challenge to you for Lent. 1) Get the book (Here, if that helps). 2) Join us in class. We’ll meet at Good Sam, right after Vespers (6:30 pm) for the five Wednesdays in Lent at 7:00 pm beginning February 21. 3) Check out Kate’s blog, you might actually enjoy her writing style. 4) And finally, bring your faith with you and be ready to further your journey of inviting God to walk with you through this challenging world as it is. I am so excited to walk this walk with you. Here is a great motto for living in faith: Hard times are best endured together. 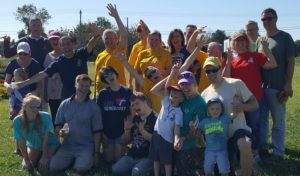 On Saturday September 23rd more than 25 Good Sam members, 30+ Peace Waldorf members, and almost 20 St Nicholas members enjoyed the wonder and fun that happens at Farming 4 Hunger in Hughesville. We picked Sweet Potatoes, listened to JRP music, talked, visited and enjoy some time of personal sharing from two of the work release program participants at the Farm. It was a grand time and the saying continues to be true, “all are fed on the Farm.” Thanks to Christy H, Becky D. and Erika D who coordinated the effort for the three Lutheran Congregations present. 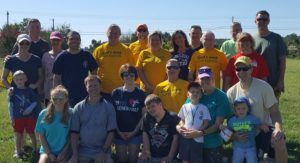 We were also joined by 3 or 4 other community youth groups and one American Heritage activity group to round out the numbers and the fun. God truly showed up and blessed all who were present. Our annual Church Picnic will be held Sunday, Sept. 24 on the church grounds right after Sunday School at 11:30 A.M. We will have lots of food, fun, and fellowship. We ask that folks bring a side dish, salad and/or dessert to share, drinks and meats will be provided. Would you like to help? We’re looking for volunteers to help setup & clean-up, man the grill, engage the kids in games, and set up the volleyball net. If you would like to help, please sign up in Fellowship or contact Judy Kowalik. All are welcome, please join us and enjoy a relaxing time to socialize and enjoy a good meal. August 26, 5:30 to 7:30 pm ◊ Community Listening Event / Open Mic… Pizza, Music, community partners and leaders share what they see happening and needed in our local community. 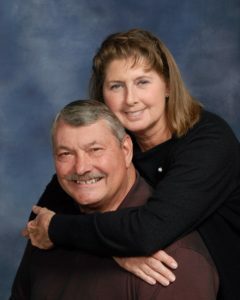 In an effort to get acquainted with everyone in our Congregation and get to know our families and friends, each week we will spotlight on a Family or Friend of Good Sam Lutheran Church, In addition we will be posting pictures and locations of where our families are originally from in the Fellowship Hall on the Big US Map. It’s interesting to see where we all hail from. If you would like to add your picture on the map, contact Michael in the office. We truly are Finding our neighbors along the journey of faith! Kevin and Denise King have been married for 21 years and have 3 children and 9 grandchildren. Kevin is originally from Omro, Wisconsin and Denise is from Hollywood Maryland. Kevin retired from the U.S. Navy and Denise is a retired Teacher. They have been charter members of Good Sam Lutheran Church since 1970. Kevin and Denise enjoy Gardening, spending time with their Grandchildren and operating a Country Craft Store in Valley Lee, Maryland.